December 1, 2011 at 12:07 am. 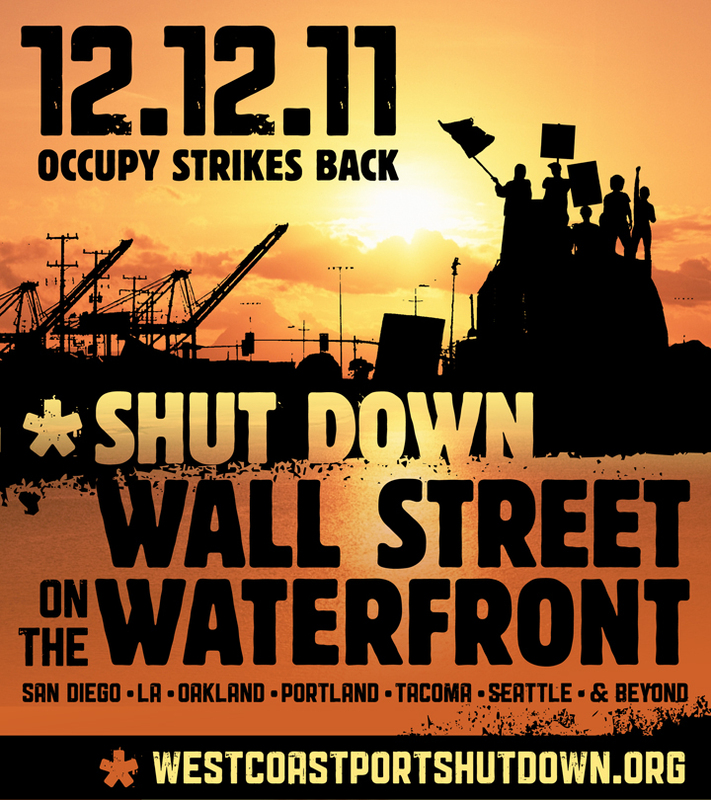 As of November 27, 2011, the Occupy movement in every major West Coast port city: Occupy LA, Occupy San Diego, Occupy Portland, Occupy Tacoma, Occupy Seattle have joined Occupy Oakland in calling for and organizing a coordinated West Coast Port Blockade and Shutdown on December 12, 2011. Other West Coast Occupies, including Occupy Anchorage and Vancouver, Canada are planning to join the economic blockade and disruption of the 1% on that date, according to organizers. “We’re shutting down these ports because of the union busting and attacks on the working class by the 1%: the firing of Port truckers organizing at SSA terminals in LA; the attempt to rupture ILWU union jurisdiction in Longview, WA by EGT. EGT includes Bunge LTD, a company which reported 2.5 billion dollars in profit last year and has economically devastated poor people in Argentina and Brazil. SSA is responsible for inhumane working conditions and gross exploitation of port truckers and is owned by Goldman Sachs. EGT and Goldman Sachs is Wallstreet on the Waterfront” stated Barucha Peller of the West Coast Port Blockade Assembly of Occupy Oakland. 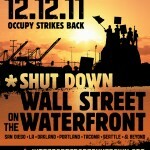 Each Occupy is organizing plans for a mass mobilization and community pickets to shut down their local Port. The mobilization of over 60,000 people that shut down the Port of Oakland during the general strike on November 2, 2011 is the model for the West Coast efforts. Organizers state that a police attempt to disrupt the port blockade or police violence against any city participating will extend duration of the blockade on the entire coast. “These Ports are public. People have a right to come to the Port and protest. The ILWU has historically honored picket lines at the Port.” stated Clarence Thomas, a member of ILWU Local 10. ILWU longshore workers are involved as individuals in the planning of the Shutdown. “I am a longshoreman and I support the December 12th Blockade against EGT. EGT is a threat to the survival of the ILWU,” stated Anthony Leviege, a member of Local 10. Dan Coffman, the president of Local 21 in Longview, has publicly thanked the Occupy movement and Occupy Oakland for its actions on November 2nd. Further interviews and details can be obtained through local Port Blockade committees and the Oakland West Coast Port Blockade Assembly. I think this action has great potential for showing the whole world that there is a populist push in this country to shift the economic system to favoring the middle class once again. But I also think there’s huge potential for it ending up as looking like an angry mob with pitchforks looking for a mindless riot. Here’s my suggestions, which I will also attempt to bring up at a GA or Port Meeting. 1. Continue to work with the various unions. Even if they are not officially on board. Even if it’s just talking with individuals. Let them know this action is not to punish them, but rather they have great power and we need the help of the labor movement to save the middle class. 2. Do not say this action is to punish cities for removing occupy camps. I’ve heard this enough times, even in the media, and this can be dangerous. The action needs to be about economics, not about camping. Plus, if it’s to punish the city, what we saw with the Oakland port shut down in Nov, is that there were individuals who did not feel protesting in the streets and the port shut down was not enough. They felt a need to punish the city more through their individual actions, smashing windows, taking over buildings, lighting fires, provoking police to turn it into a full scale riot. 3. Loose the line that if there is violence, the port shut down will last longer. This can still be true, even if it’s not said. By saying it, it’s basically saying “we can do whatever we want, and if you do anything we don’t want you to, we will punish you more”. This is not about punishing cities, it’s not about revenge, it’s not about getting our way to do whatever we want. It’s about creating an action that gets the attention of the entire world that there is a group that wants economic change. And see above for #2. If the bottom line to the occupy movement is the police are not allowed to respond with violence, I can bet you that there will be plenty of people pushing for this response. There will be individuals looting, smashing windows, lighting fires, turning it into a full scale riot. Some will be hoping for an extended shut down before the action even begins, some will just want to see how much they can get away with, some will think that their violence will get even more media attention. Whatever their individual justification, this line only enables and encourages violence on the side of the occupy groups.